White Oak Aikido benefits from having a number of instructors, all well qualified and highly experienced with many years of training and teaching experience. Here's a little bit about each of them. Simon Thackeray: I had wanted to study a martial art for some time and started training in Aikido in 1980 and progressed gradually through the grading system. In August 2004, Haydn Foster Sensei awarded me the grade of 5th dan. I started teaching Aikido at Reading University in 1985 and established the White Oak Aikido dojo at the Reading YMCA in 1991. Now 6th dan, I'm also recognised as a Senior Coach (Level 3) by the British Aikido Board. I recently achieved the Award in Education & Training, the QCF recognised qualification for those working in the further education and skills sector. I was a direct student of Haydn Foster Sensei (7th dan) from 1983 until Mr. Foster sadly passed away in February 2011. I've also attended many Aikido courses with other high ranking English, American and Japanese teachers and I continue to attend courses to ensure my ongoing development. As well as serving as his Technical Assistant for many years, I also accompanied Haydn Foster Sensei on Aikido teaching tours of New Zealand, organised by Kyu Shin Do Aikido in Auckland. Aikido has been a key part of my life since I started training in 1980 and has driven my interest in achieving a better understanding of the human body and mind, qualifying in massage in 2003 and then going on to train in the Chinese internal energy arts and martial arts from 2004. I have seen many of my students improve not only their skills and confidence, but also develop their overall potential. I am passionate about the need for strong foundations and regular practice to underpin good form and to maximise the benefits from the arts that I teach. I believe in the need for strong, effective, basic technique and practice with the bokken and jo as a foundation for good Aikido. I am obsessive about technical accuracy and inculcating an understanding of the basic principles of this fascinating martial art, creating a strong base of skills and knowledge from which people can genuinely improve and train at their highest level. I enjoy passing on whatever understanding and skills I have in Aikido, to whoever is prepared to take any notice, and seeing people develop and benefit. In addition to Aikido, I also train regularly in Tai Chi and Qi Gong, as well as teaching weekly classes in Qi Gong (Chi Gung) at the Viables Community Centre in Basingstoke (map) and the Caversham Heights Methodist Church Hall in Reading, as well as longer Qi Gong Workshops in Bramley every two months. I sometimes train in Bagua and, some years ago, I also briefly studied Karate. Trish Matthews: I started my Aikido training at the University of Reading in 1993, having had a vague inter est in Aikido since seeing a documentary on a climber and Aikido practitioner called Julie Tullis and also reading that Aikido was one of George Lucas’ inspirations for the Jedi! I haven’t climbed Everest or become a Jedi, but Aikido has been a key part of my life for some 25 years. 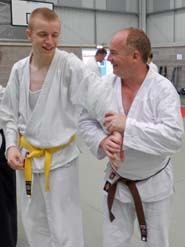 I’ve been teaching Aikido at Reading since 1997 and was awarded 4th dan by Haydn Foster Sensei in August 2010. I am recognised as a Coach Level 1 by the British Aikido Board. I’m fascinated by how physical activity, especially martial arts, is a trigger for developmental change and learning in all areas of people’s lives. I recently completed an MA in coaching and mentoring, and my thesis focussed on this area. I’m currently involved in social and therapeutic horticulture, active and experiential learning for children, basket making (www.jackdawbaskets.co.uk) and life coaching/crafting (www.magpie-coaching.co.uk). I also hold the Award in Education & Training, the QCF recognised qualification for people working in the further education and skills sector. I love how Aikido enables people to express and protect themselves in a way that aims not to cause unnecessary harm to the other person, with a focus on compassion rather than aggression. Learning to deal with physical confrontation and the fears around that, can change how you connect to the world around you, although these benefits can only come from training that stays true to its martial origins and a system underpinned by realistic, functional principles. One Reading Aikido member said: "(Trish) teaches with warmth, spirit and a joyful energy. She has a way of making you remember the technique more." Julie Tullis' book on Amazon with some impressive pictures of her practising bokken on Everest. John Butcher: I started training at White Oak Aikido in Reading in 2001. I had just moved to Reading and saw this as an opportunity to start a new martial art, having previously studied Yang Style Tai Chi. I wanted to do Aikido as I saw in this martial art its potential as a self-defence system which does not rely on physical strength or size. I achieved British Aikido Board Coach Level 1 in 2011 and my 1st Dan in 2012. In my own Aikido training and teaching, I am now drawn to a deeper study of some of the different aspects within Aikido such as the esoteric, the physical, physical fitness, and developing the mind-body connection. The training in body technique along with the weapons training, using the Bokken and Jo, make this for me a balanced and rewarding martial art to study and teach. Coach Level 1. I came to Aikido after training for some years in a range of combat sports, including boxing, kickboxing and karate. The first thing that attracted me to the Aikido club was that everyone was so friendly and helpful and if I ever struggled with anything, all I had to do was ask and they were all willing to help me. One of the things I love about Aikido is that moment when I end up on the floor in a lock or a hold and I wonder just how I got there! Since I started the Aikido classes in Reading, my life has changed for the better. I love my training, so if you think you might be interested, come along and have a go. You have nothing to lose and everything to gain. Looking forward to seeing you on the mat. Michael Moody: 1st dan and British Aikido Board Coach Level 1. 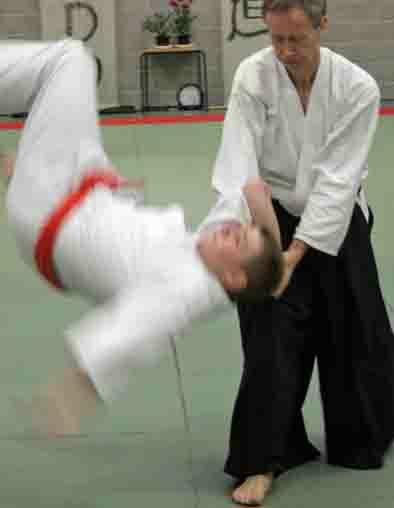 All White Oak Aikido instructors are insured and hold a First Aid qualification.